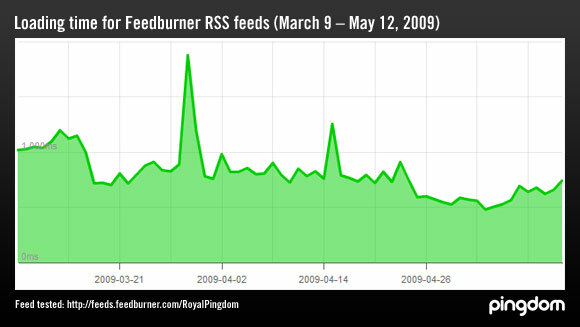 A huge number of blogs use Feedburner to syndicate their RSS feeds. Since the service was launched in 2004, it’s pretty much become the de facto standard for this. With so many bloggers relying on Feedburner, reliability and performance is of course extremely important. RSS feeds, just like websites, need to be available all the time on the Web. Since Google presumably uses the same infrastructure for all Feedburner feeds, that should be indicative of the overall performance of Feedburner feeds in general. Now that we’ve been monitoring the RSS feed for over two months, we thought it was a good time to have a look at the results and see how Google is handling Feedburner’s feed delivery performance so far. We started the monitoring in March (on the 9th, to be precise). Counting until now, May 12, the tested feed has been unavailable for a total of 53 minutes, resulting in 99.94% uptime (availability). A 99.94% uptime means that the feed will be unavailable for 5 hours and 15 minutes over the course of a year. This is actually not bad, although considering the resources of Google, it can probably improve this number significantly. Most of the problems appear to be short, temporary issues. The longest outage was a mere 13 minutes, the second-longest was 10 minutes, and the vast majority were around a minute (we detected 18 outages in total). The longer-lasting problems were due to severe slowdown (if we couldn’t load a feed in 30 seconds, we counted it as unavailable). Bigtable is Google’s proprietary database system. Feed loading time: Gradually improving? Over the period, the average loading time for the feed was 0.8 seconds. This is the average across all locations, both in Europe and North America. As you can see in the below graph, Google seems to have gradually improved the overall performance of the Feedburner feed. When we started our tests in March the average load time for the feed was over a second on average, but after that performance has gotten better. There was a period of significant slowdown the last couple of days in March, but after that performance has been relatively stable. Note that the values in the graph are averages counting over an entire day. Unfortunately we don’t have any data on how the feed loading speed was on the old Feedburner infrastructure. It would have been interesting to compare. 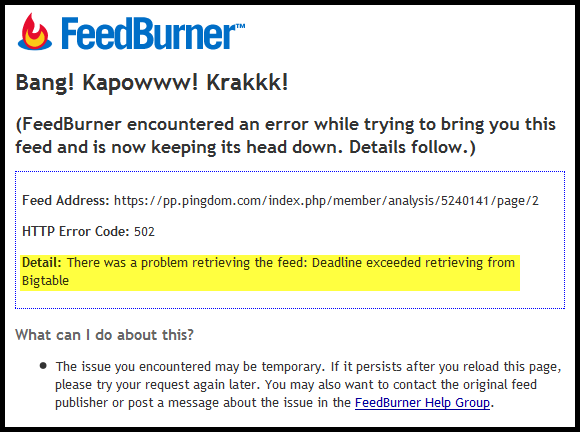 Feedburner (now Google) has had its fair share of problems with the reporting part of its service, most recently at the beginning of April. However, here we only looked at being able to properly access and load the RSS feed itself (essential for feed readers). We have to say that Feedburner definitely gets a passing grade, although both uptime and performance has room for improvement. Google says it’s still working on improving Feedburner behind the scenes, so it will be interesting to see what happens in the coming months. All monitoring in this survey was done with the Pingdom uptime monitoring service. For a feed to count as unavailable, it had to fail to load from two different locations. The worst thing about feedburner is to this very day you cannot specify which format you want the feed in, you have no choice, it tries to guess based on the user-agent of the application fetching the feed. Even after google took it over they never added a URL option for alternate formats despite many requests.